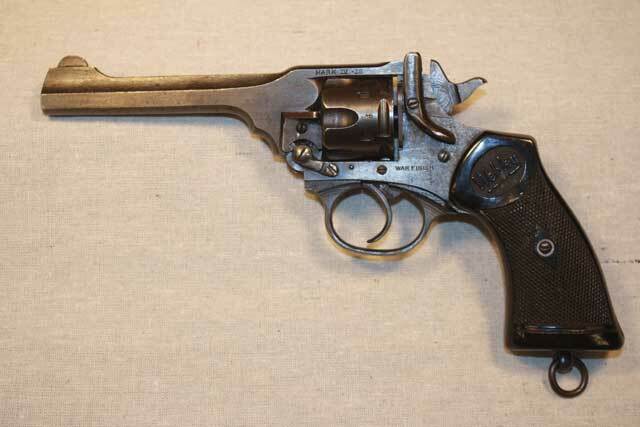 Webley and Scott had produced revolvers for the British military for a long time. Their .455 revolvers had ruled the subcontinent of India, and taken tigers in Africa. The .455 Webley revolver was synonymous with Officers sidearm. Before WW1 came along, an officer could carry any sidearm he wanted, as long as it shot a service .455 round. The First World War changed that paradigm forever, and everything got standardized, and when the war was finally over, downsized. The Webley Mk. IV was a result of many things. Armies had got conscripted and had to be trained in a hurry, so no time for training to handle the big .455's. A gun was needed that any young recruit could master in a hurry. (Which means firing it without dropping it!) The government also wanted to spend less money on purchasing arms. Webley already had a revolver in the works that met the specifications. 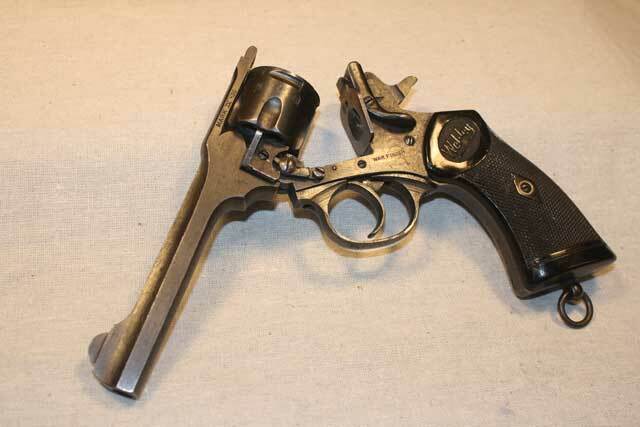 The Webley Mk III in .38 S&W. 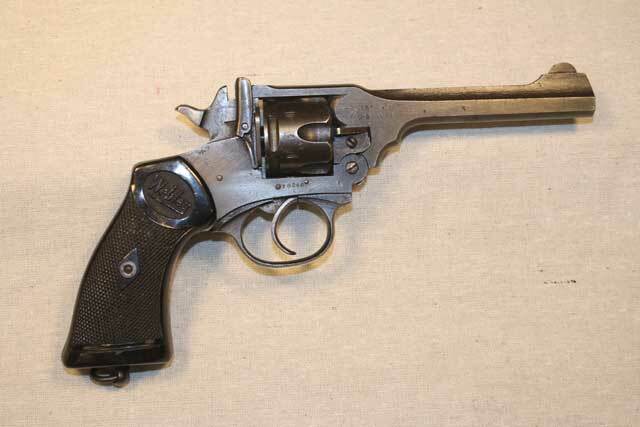 With a little work, they adapted this civilian and police revolver to look like a miniature Webley Mk. VI. Enfield was assigned with Webley to come up with a design, but the revolver was already done. With the designs in hand, Enfield came up with their version, which was adopted by the government, mainly because they were already a government agency. Webley was left holding the bag. WW2 happened along, and Enfield couldn't keep up with the demand for it's version of this little revolver. The British government contracted for all the Mk.IVs that Webley could make, as this turned out to be a big war. The demand was so great that Webley had not the time to finish the revolver properly, and frankly they were embarrassed by the fact they had to leave grind and tool marks on the gun. The obvious solution was to spell it out, and wartime Mk. IVs had War Finish stamped on the left side. 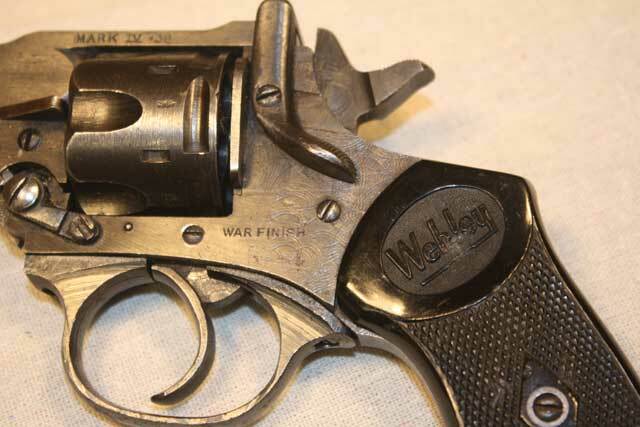 This plucky little revolver fired a .38 caliber version similar to the .38 S&W Super Police. The round was shorter and fatter than a .38 Special, and had a special lead bullet that weighed more than the standard .38 S&W bullet, coming in at 200 grains. Some government tests stated that the round proved to be similar in stopping power to the .455. I would have to say any gun can kill a guy, but this bullet is no .455. The Mk. IV is sturdy and very reliable, and it's almost impossible to wear it out. Parts are easily available (wish that were true for Mk. VIs) but resale prices have never really caught on for this robust revolver. If the pistol had been imported into the US after 1968 they suffer the indignity of a cross bolt safety having to be added to satisfy the BATF. This does rather ruin the lines of a collectable gun. This example escaped that fate. By 1954 the British were done with revolvers, and the Browning Hi-Power became the standard British sidearm.